Before resuming Ms. Foy’s testimony, am I correct in thinking Mr. Clarke may wish to raise some brief matters? MR. CLARKE: Yes, Sir. I have two matters I wish to raise. The second, to which I will come in a moment, is the question of the Terms of Reference that arose out of the content of Mr. Coughlan’s opening of this phase of the Tribunal on the 6th of October. As I indicated on that occasion, I might have some brief submissions on that topic to which I will return in a moment, however, Sir, the first matter I wish to address, arises out of an impression that may have been given in a newspaper article earlier this week to the effect that you might have initiated contact with the Attorney General or other persons in relation to the possibility of constraints on you being able to deal with certain matters effecting CRH, that might or might not come up in the course of your Inquiry. I have been asked by the Attorney General to put the factual matters pertaining to that issue on the public record. I would like to do so. They are obviously in the main matters of which you are aware, Sir, and the Attorney feels, and we respectfully agree it is a matter that should be clarified publicly. The first point to make, Sir, is that it would be wrong to accept the impression given in that newspaper article, that you had initiated any contact. Such contact as occurred was on the initiation of the Attorney General himself, and it was done in the context of a resolution currently standing for consideration before the Dail in the name of the Deputies of the Labour Party, dated the 12th of October, which touches on the business of this Tribunal. In the context of that resolution the Attorney General was asked to tender certain legal advice, and felt it appropriate to contact you for the purposes of ascertaining the viability of the course of action that was proposed in that resolution, at least insofar as it concerned your own role in matters. The Attorney General did so, and I want to make it absolutely clear that the contact was initiated by him and solely for the purposes of dealing with the resolution that stood before the Dail. On foot of that contact it is correct to state that the Attorney General initiated consultation with the parliamentary leaders of each and every registered political party represented in the Oireachtas, for the purposes of ascertaining their views, and for the avoidance of doubt, I should say that those contacted were the Taoiseach, the Tanaiste, and Deputies Bruton, Quinn, Sargent, Higgins and O’Caolain. And each of those instructed by the Attorney General has indicated his agreement to you proceeding as far as you can with any inquiry that properly arises within the Terms of Reference, without prejudice to the individual views on broader questions of the Terms of Reference which each of them hold. I am instructed by the Attorney General as Counsel for the Public Interest, to make such a formal submission, and with that backing to you, to the effect that the Tribunal should proceed as far as it is lawful, without constraining itself from dealing with any matters in particular, and that there are no, at this stage, no constraints upon you so proceeding. I should say of course, Sir, that to make any specific submissions about how you might be able to proceed in any particular set of circumstances will necessarily be premature, and they could only be made in the light of such evidence as the investigative phase of the conduct of the Tribunal might have revealed. In much the same way as I will in a moment be able to make submissions relating to the Terms of Reference question arising out of Mr. Coughlan’s opening of this phase of the Tribunal, I am sure that if we don’t know at this stage, we don’t wish to know, whether any information has come to the Tribunal’s attention, that would lead it down any particular road at all, but if any such information did come to the Tribunal’s attention which it wished to, which it felt should lead it into a particular area of inquiry, and if any, if there were perceived to be any difficulties about that, then and only then would be the time when it would be possible to make detailed legal submissions in the light of the circumstances as they were then known. But subject to that caveat which has no practical application at the moment, I do, Sir, formally submit to you that the views expressed to the Attorney General by the parliamentary leaders are ones which are not only politically correct, in the non colloquial sense of that word, but also legally correct; that it is appropriate for you at this stage to continue as far as it is lawful with any areas coming to your attention that fall within the four walls of the Terms of Reference given to you. Obviously also, Sir, it would be necessary to note that if any particular circumstances arose, then there might well be other parties who might have the right to be heard in those circumstances, but again, until practical circumstances arise that situation doesn’t exist. The other matter, Sir, concerns the question of, question of the interpretation of the Terms of Reference of the Tribunal, and I suppose with particular reference to certain payments to Mr. Ellis, which were referred to initially in the opening address of this phase by Mr. Coughlan on the 6th of October, as recorded at page 30 of the transcript, and which were then the subject of certain evidence tendered by Mr. Ellis thereafter. And as Mr. Coughlan pointed out in the course of his opening, they raised the question of whether a payment to a TD may come within, a particular Term of Reference C, in the sense of whether the phrase “Public Office” is sufficiently wide to encompass TD and not merely the holder of ministerial office? I think it is important to note, Sir, that that subject was at least to some extent debated in the courts in the proceedings brought by Mr. Haughey, in which you, Sir, were named Defendant, and the Attorney General was the Second Named Defendant, and were the subject of certain findings in the High Court by Mr. Justice Geoghegan, but I think it is important to note that the Supreme Court expressedly declined to make any findings as to the interpretation of the Terms of Reference, and indicated that at least at the first instance they were a matter for each Tribunal, and it was on foot of those findings that I think you, Sir, met as the Tribunal and gave an initial indication of your interpretation of the Terms of Reference, subject of course to the fact that they might always need to be clarified or redefined in the light of circumstances as they might evolve, and that is the process with which we are involved here. It seems to me, Sir, looking at the Terms of Reference as a whole, that it is important, as it were, to attempt to derive certain general principles about what the Terms of Reference are about before attempting to apply those to the precise language of each of the individual terms. And if I might echo something I said in a different context in submission to you some months ago; it seems to me that in broad terms the Terms of Reference require, or are in two parts; they require you firstly to identify certain, what I might call “qualifying payments”, payments that come within part of the definition, and they then require you to identify whether on foot of those payments, some element of the public decision making process may have been affected. It is that second aspect that gives the Tribunal its public face. The mere fact that payments were made from one person to another person is not a legitimate matter of inquiry or public interest. If they were made in circumstances that might give rise to an inference that some public decision making process was affected by them, then it very clearly is a matter of legitimate public inquiry and legitimate public interest. And it seems to me that all of the Terms of Reference, with the exception, I suppose, of those that are peculiar to the Revenue Commissioners, are designed towards that general end, identifying payments and identifying whether the public decision making process was affected by those payments or might have been affected. And therefore in my view, the question in interpreting the wording of the Terms of Reference is to identify that public decision making process. And I would say therefore, Sir, that the test as to whether an office might properly be regarded as a public office in the sense in which that word is used in Term of Reference C is, is it an office which is capable of exercising or significantly influencing the public decision making process. That’s the test. Obviously – the most obvious and clear-cut case is ministerial office, because Ministers being the holder of the executive power of the State under the Constitution exercise public decision making on a daily basis, and they also significantly influence public decision making by having the power to present legislation with the support of the Government to the Dail, in the reasonable expectation that it is highly likely to be passed. But I don’t think, Sir, that that, that the term “Public Office” is confined in that way. And in my submission it is a matter that needs to be considered on the facts and merits of each case as you find them, as to whether the person at the time held an office which was sufficiently capable of influencing the public decision making process as to bring it within Term of Reference C.
I don’t think it is possible to give any general list of those that qualify or don’t qualify, but on the facts of this case we already have had the evidence which was tendered on the same day, I think the 6th of October, when Mr. Ellis was giving evidence and being questioned on behalf of the Tribunal by Mr. Healy, at Question 238 on page 79. It is quite clear that there is evidence that the circumstances at the relevant time had a very direct impact on whether the then government might or might not survive. The question that was asked on the transcript on that occasion was: “Did you have any discussions or did he have any discussions with you or discuss the importance of the position of the government?” “Answer: He did, he said, you know this would lead to the Government falling if I were to be declared bankrupt”. It would seem to me to be irrational to construe the Terms of Reference in such a way that the Government Minister was necessarily the holder of public office, because he could make a decision, but someone who held another public office, the office of Teachta Dala, who kept that Minister in office and allowed him to continue to make decisions was to be totally excluded from the possibility of being considered to be the holder of public office. Therefore, in summary I say two things, Sir: I say the question in principle of whether someone may be said to hold a public office is determined by whether there is a sufficient connection with the public decision making process to enable him or her to be properly so called. And I will have no difficulty in agreeing and submitting that on the facts as we now know them, as has been brought to the attention of the Tribunal, and insofar as it has already been covered, lead in evidence, would lead me to the view that it would be entirely appropriate in those circumstances on the facts of this case, to hold that Mr. Ellis does hold sufficient public office to bring him within the Term of Reference. Clearly, like I said in relation to the other matter upon which I had to address you, if further circumstances of difficulty arise, it might be necessary to consider them in the light of whatever facts might emerge on that occasion. I think it is the kind of matter that might have to be dealt with on a case by case basis. But I certainly have no difficulty in submitting that on the facts of this case those matters clearly come within the Terms of Reference. I have no further submissions, Sir, unless there is any issue you wish me to deal with? CHAIRMAN: Not really, Mr. Clarke. Thank you very much for your attendance. Mr. Coughlan, anything you wish to say at this juncture in relation to any of those matters? CHAIRMAN: Three matters have been helpfully alluded to by Mr. Clarke in his remarks, on behalf of the public interest as regards most of the submission, and on behalf of the Attorney General, as regards the last of the matters. Two of those matters pertain to the Terms of Reference of this Tribunal, and the third relates to a very transient and more ephemeral aspect which I will deal with in conclusion. It is obviously imperative that any decisions or rulings pertaining to construction of the Terms of Reference of the Tribunal be undertaken with the greatest care and circumspection, particularly in relation to the aspects touching upon the Cement Roadstone Holdings potential issues. It seems to me that whilst of course I will note the matters that have been stated by Mr. Clarke in relation to the apparent views evinced by political leaders in the Oireachtas, and while I will act with appropriate speed in dealing with this aspect, it would be premature if I were here and now to give an ad hoc ruling on the matter. There are aspects of confidentiality which are central to the Tribunal’s dealings in all respects, and it would be quite wrong if I were here and now to say anything that might indicate or imply that the Tribunal in the course of its confidential inquiry either had or had not what might appear to be justifiable grounds for investigation in relation to any of the matters covered under that general nexus. In addition, there are parties who it seems clear to me, as indeed confirmed by Mr. Clarke, would have to be given notice and an opportunity to be heard before any ruling were to be made on that aspect. Accordingly, whilst I will deal with this as a matter of urgency, it seems to me, that for those reasons, it would be precipitous and wrong for me to give an ad hoc ruling here and now. The lesser matter that arose in the context of Mr. Clarke’s observations as to the Terms of Reference on behalf of the public interest, related to the phrase “Holder of Public Office”. 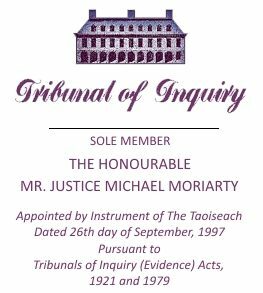 I accept that in the course of dicta of Mr. Justice Geoghegan, in the High Court proceedings in the suit entitled “Haughey and Others against Moriarty and Others”, that Mr. Justice Geoghegan expressed a preliminary view to the effect that a holder of public office would appear to him to be equated with a holder of ministerial office. As Mr. Clarke correctly reminds me, the Supreme Court indicated that it was preferable that no view be expressed by either court on construction of the Terms of Reference and that the matter be left in the first instance to construction in accordance with fair procedures by the Sole Member. But without necessarily taking on board all that Mr. Clarke has submitted, although I do of course attach obvious and deserved weight to his observations (in relation to the criteria of the degree of nexus with the public decision making process being the primary criterion upon which to view the potential involvement of a particular office holder), I feel that as regards what has transpired thus far in the context of Mr. Ellis, and the circumstances in which his evidence came to be given last week, that the Tribunal is justified as regards his involvement as a member of Dail Eireann, in proceeding with the reception of that evidence in relation to his involvement. I accept, as submitted by Mr. Clarke, that other contingencies may arise down the road in the course of the Tribunal’s further sittings, and should they do so, in accordance with appropriate procedures, the parties or the persons who may be affected will dually be heard, and a ruling can be given in relation to each particular contingency that may arise. It is clear to me, and I do so find, that it is appropriate that the Terms of Reference extend to the contingency affecting Mr. John Ellis as set forth in evidence last week. The last matter relates to an infinitely more trivial and perhaps personal matter, and I do not want to dwell long on it. Insofar as it relates to an article in one of yesterday’s national newspapers. Mr. Clarke has correctly and properly indicated that in fact the only contact on his instructions, that was made with, by or on behalf of the Tribunal was through Mr. Michael McDowell as Attorney General, having contacted me in the course of a telephone conversation two days ago about the possible contingencies arising from the motion that had been brought before Dail Eireann in the name of the Labour Party by Mr. Brendan Howlin, its Deputy Leader. Apart from that telephone conversation with Mr. McDowell and a further telephone conversation, which I stress, was not initiated by me, but was made to me by Mr. McDowell, arising out of yesterday’s national publication, I have had no dealings whatsoever with any leader of any political party, and I am at an absolute loss to understand how any journalist contrived to record that I was canvassing leaders of political parties. I do stress, and I think Mr. Clarke you will confirm, that your appearance here today in that regard is not on behalf of any request of mine to you or to the Attorney General, it is resulting from the two phone calls from Mr. McDowell to myself. It does not behove one holding this particular appointment to become thin skinned, and I do not intend to dwell upon it, but it does seem to me, it was an inaccurate and perhaps somewhat unpleasant reference that was made and I would be somewhat grateful if on this occasion the author of the article did see fit to correct it.